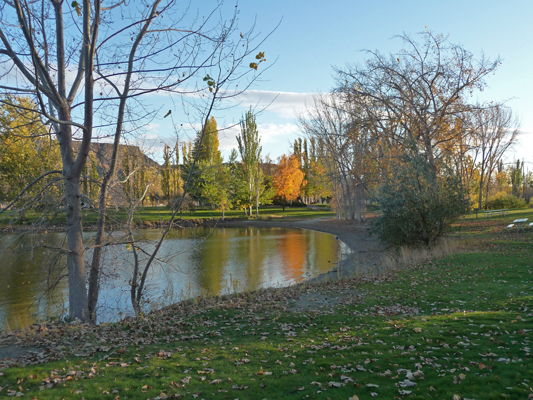 We left Sun Lakes Resort in Eastern Washington on Monday morning October 12th under sunny skies and nary a breeze. As we drove up to the highway we stopped so I could take a photo of Park Lake and it’s mirror-still water but I got a better shot later through the car window as we drove north! 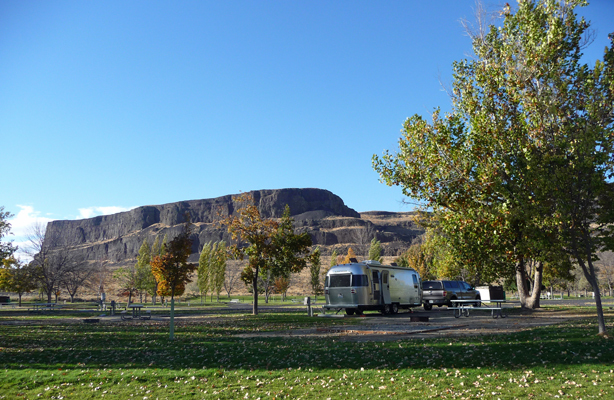 We drove for less than an hour to reach Steamboat Rock State Park on Banks Lake just south of Grand Coulee Dam. 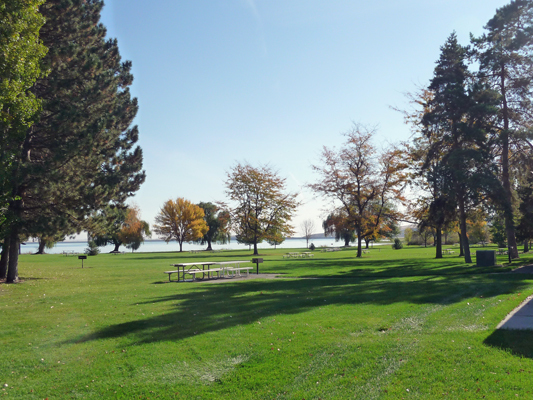 The campground was very sparsely populated and we found a nice spot overlooking the lake. 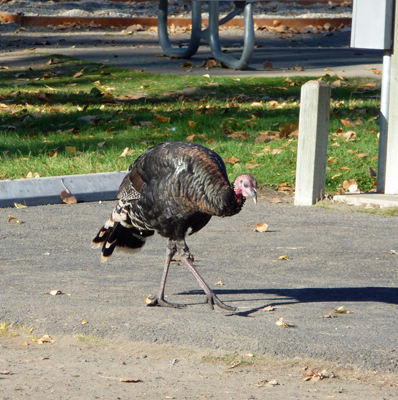 We spied a flock of wild turkeys while we were looking for a spot. We’d see more of them as the days went by. Steamboat Rock has been used as a landmark for centuries though obviously it didn’t get it’s current name until the last century when settlers first started crossing Grand Coulee. Banks Lake fills part of the original huge dry valley called the Grand Coulee—a valley carved by the Columbia River during the Ice Age when it was forced to flow further south than it does now. 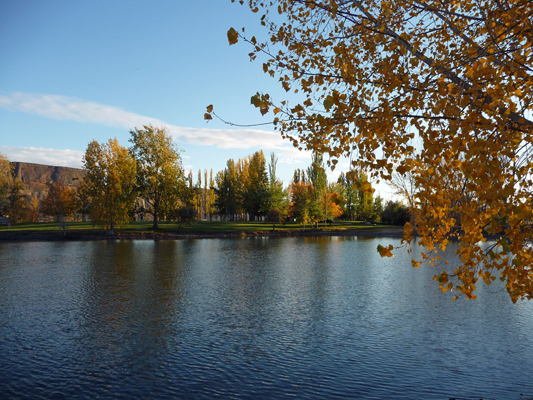 Banks Lake provides irrigation water for farmers in the Columbia Basin. They pump water from behind Grand Coulee Dam through a canal and into Banks Lake. It doesn’t vary much during the year even during a drought because the Columbia is such a huge water source. 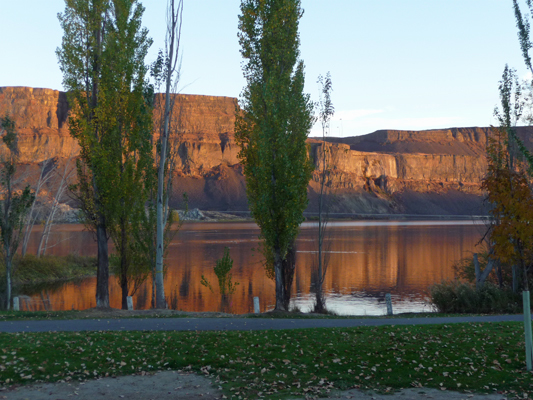 Because of the rock formations in the Grand Coulee, it’s a very pretty lake. The entire setting is pretty spectacular. We settled in after paying our camping fees of $35 a night for a full hookup. Mid afternoon, we got a new neighbor and he stopped to ask how registration worked. In the process of talking with him, we learned that the Washington State Parks have an off season senior pass that allows you to dry camp for free and to only pay $10 a night for a full hook up! We went back to the registration booth and found a ranger there (there’d not be anyone there when we first checked in) and talked her into giving us our money back and selling us a pass. We were planning on going down to Potholes State Park after Steamboat so the $75 for the pass would pay for itself quite quickly. The pass is good until the end of April 2016. 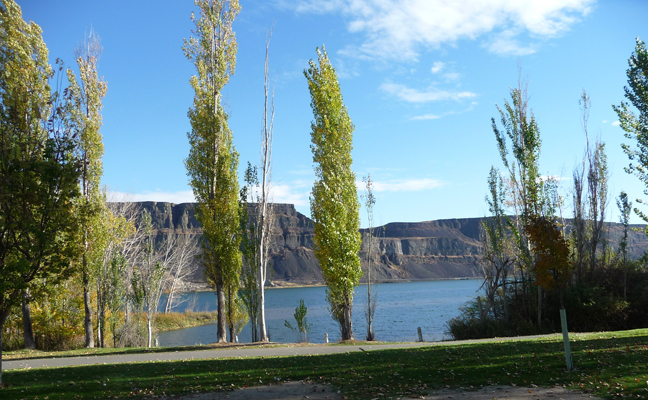 If you plan to do any fall, winter or spring camping in Washington and you’re over 65, this is a GREAT deal because normally even in the off season the Washington State Parks are not cheap. 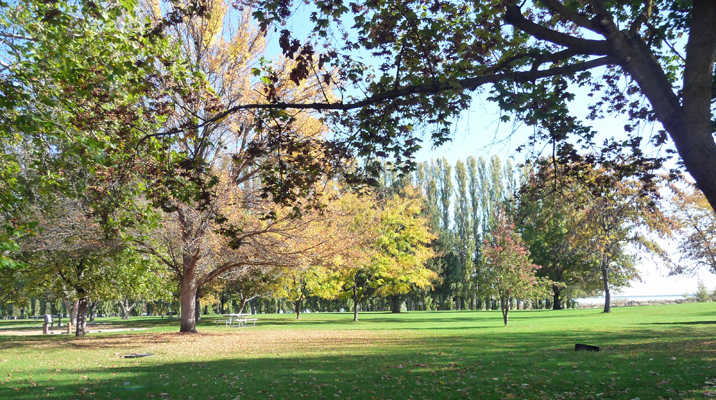 Having secured my bargain for the day, we went for a walk through the campgrounds and down to the boat launch. 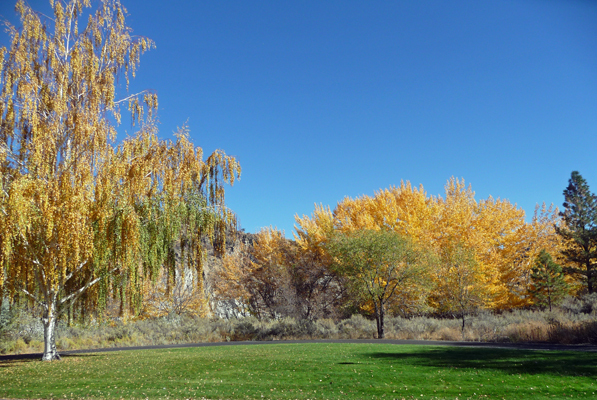 The fall color in the Day Use Area was lovely. And the view from the dock northward was pretty swell too. We’ve kayaked up that way in previous years but it was just a little cool for kayaking in October. On our way back, the water had stilled some and I caught the fall color reflected in the edge of the lake. 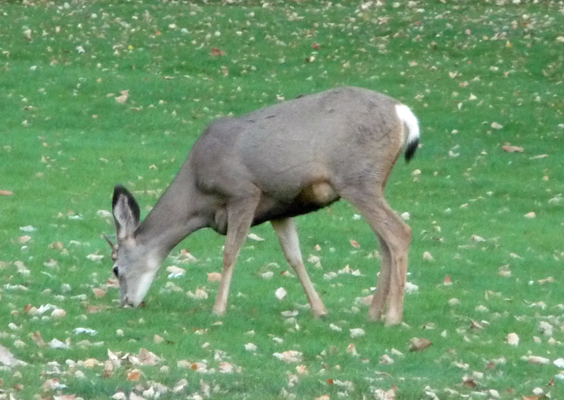 It was nearing dusk and the deer had come out to feed on the grass. By sunset there were 8 of them out trimming the lawn. And the sunset wasn’t too bad either. We stopped and talked with our neighbor for a while and I caught a flock of geese moving from one part of the lake to another. 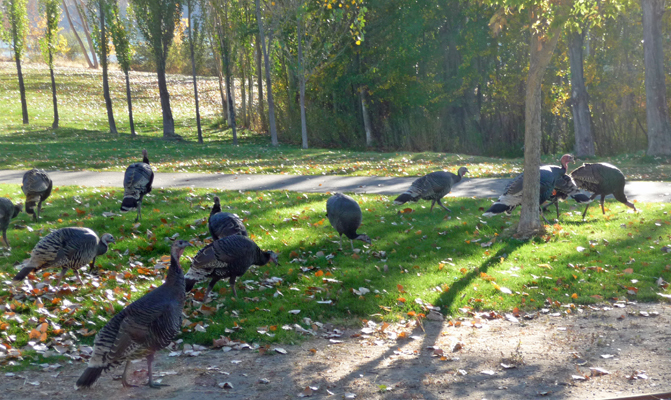 The next morning at breakfast we were greeted by a flock of 18 turkeys as they made their way right past our dining room windows. It appeared to be two flocks and there was at least one Tom who was following one of the hens around. He wasn’t real serious though, because he didn’t have his tail all spread out. In any case, these big birds are just tons of fun to watch. We had no hot spot or cell signal at Steamboat Rock and we needed to check our email, so we drove north to Electric City where we got a nice strong signal. From there we drove a little further north to Grand Coulee Dam. The sun was in our faces so this is a little washed out but it gives a sense of how BIG this dam is. There are three power houses: one straight ahead on the left, one abutting the dam on the left and one abutting the dam on the right. 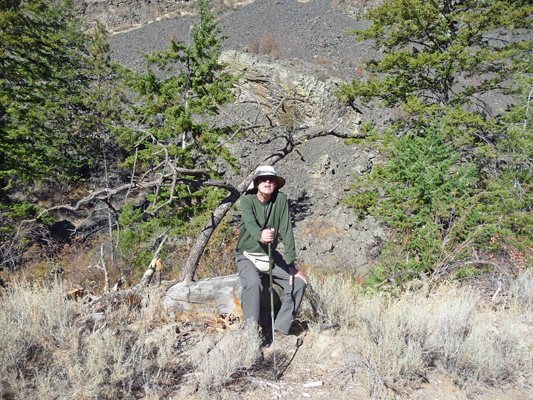 We spent some time in the museum and then drove back down to Banks Lake and the hike up Northrup Canyon. We did this hike in September, 10 years ago and saw 4 rattlesnakes, but this time we didn’t see any—just a little too cold I guess. The fall color was good through. 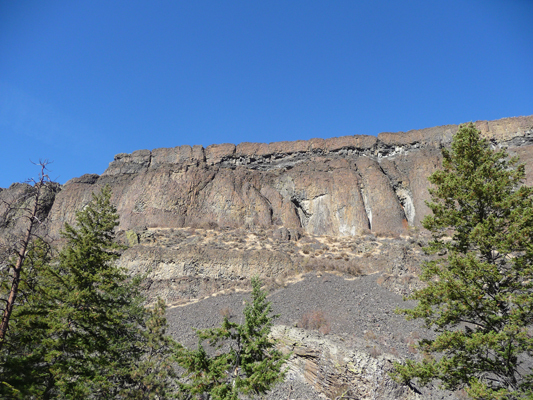 The canyon runs between two basalt cliffs that make a lovely backdrop. 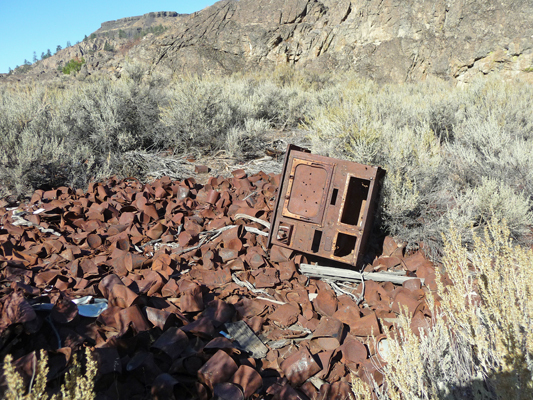 There are acres of protected tin cans along the trail. These were deposited here while they were building the Grand Coulee Dam and now are considered historical so you can’t touch them. There’s all sorts of fun stuff including mufflers and an old stove. There’s the remains of an old ranch at the end of the canyon and then you can hike another 2 or 3 miles out to Northrup Lake. We were just looking for some exercise so we just hiked until we were ready to turn around. Walter found a nice downed tree to sit on and I got a really nice boulder that wasn’t even lumpy. Here’s the top of the canyon wall from where I was sitting. Those are Ponderosa Pines. Down by the lake there are no pines at all but as you hike up canyon first there are Lodge Pole pines and then Ponderosas. 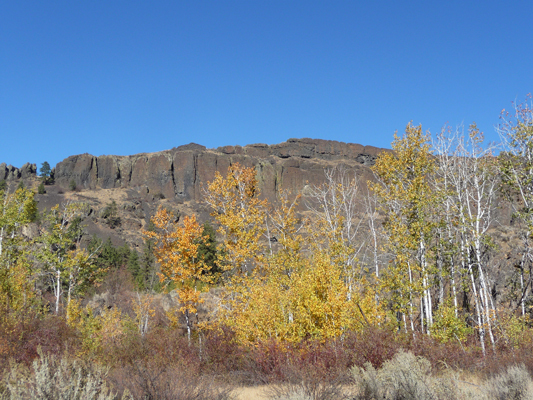 On the way back down I caught the fall color (aspens I think) against the cliffs. We drove across the road to have lunch at Northrup Point. There’s a boat launch here and I climbed up the rocks to catch a view of the lake looking north. There were fisherman down at the boat ramp pulling fish out of a huge net. They were probably Colville Indians who have fishing rights here. The building of Grand Coulee Dam really interrupted the migration of salmon and steelhead on the river and thus the lives of the native peoples up river. The fall color in the Day Use Area was pretty swell. And the view from our picnic table south along the lake wasn’t too bad either. 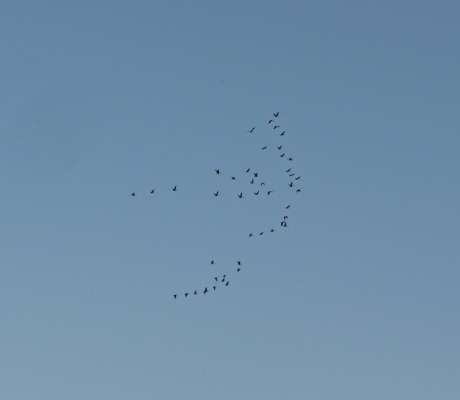 We’d seen huge flocks of quail on our walk the day before but I couldn’t get a photo of them. 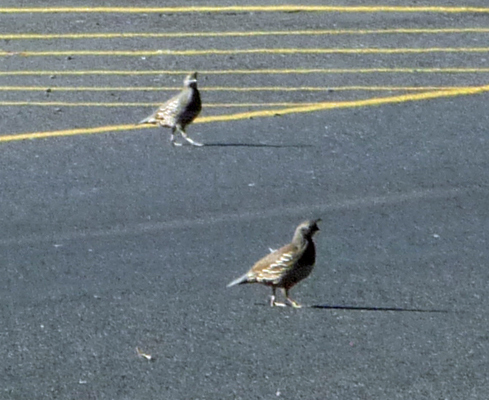 But the quail here were scurrying across the road and I managed to catch a couple. I’m vary fond of California quail—the top knot, the coloring, the way they run and their wonderful calls. Such great birds. Mid afternoon after we got back to the trailer, Walter spied a critter out in the shallows of the lake. We got out the glasses and realized it was a young buck. On further study we realized he had a growth on his shoulder. 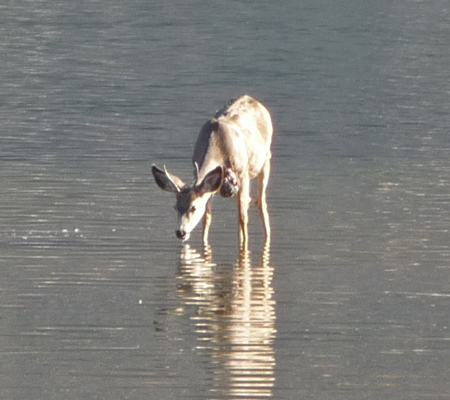 He stood out in the lake for over an hour. He drank from time to time but mostly he just stood there. A ranger came by and Walter asked about the growth and was told that it’s a virus like a wart and there’s nothing that you can do for them. Poor guy. 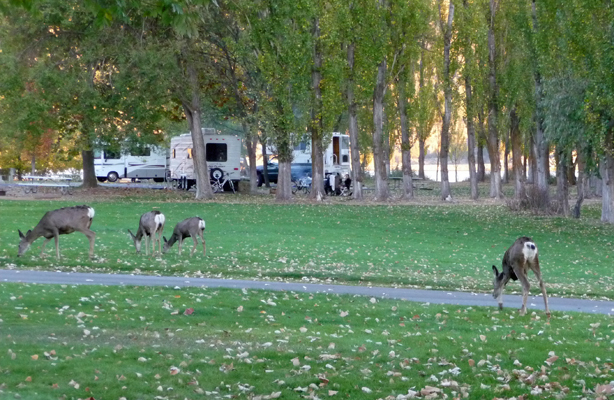 Later in the afternoon we had two groups of deer come through. They included a young buck with a single point on one side and a small fork on the other. The coulee walls to the east lit up with the setting sun, though we had no sunset to speak of. 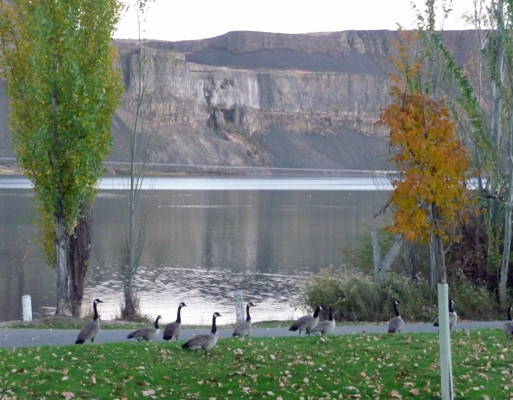 All day, we’d had a flock of about 50 or so Canada Geese in the grassy area down by the lake but at dusk they decided they needed to parade right past our dining room window to make sure we noticed them. It was getting dark and a big old buck came through skirting the bushes down by the lake and then coming up amongst the trees. It was pretty dark by then and he was on the move so he was hard to photograph. 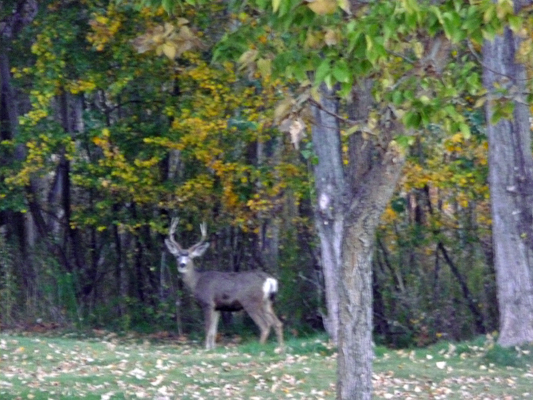 He had at least 3 points on each side of his antlers—maybe 4. 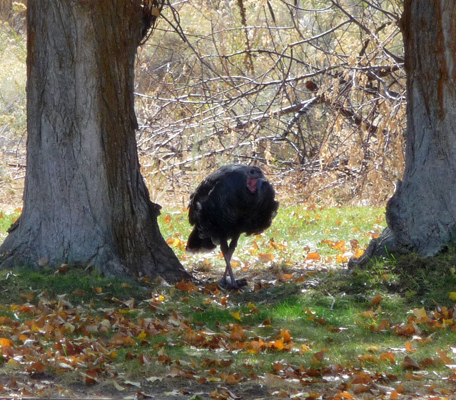 The next morning, the turkeys were nowhere to be found. But we had a flock of quail come through as we were packing up. 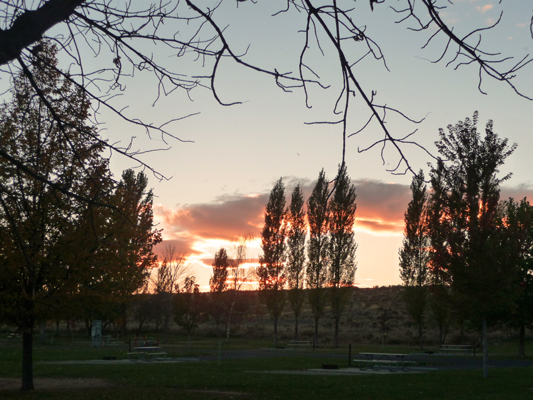 We drove south back past Sun Lakes and through the town of Moses Lake to Potholes State Park. 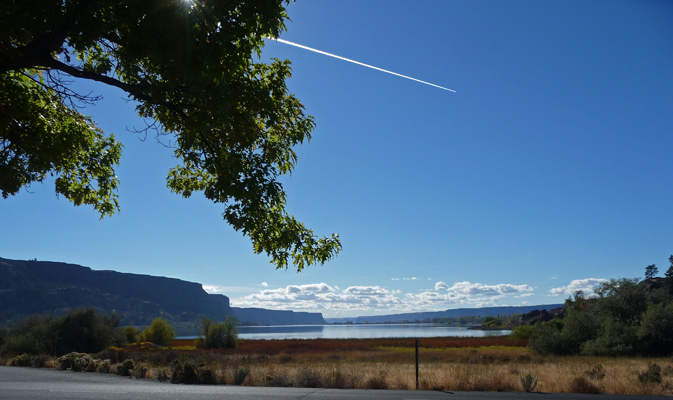 We’d camped here for a few days 11 years ago and thought we might enjoy exploring the Columbia River Wildlife Refuge while we were here. We got a nice full hook up campsite with a view of a wide grassy area (which they water with an automatic sprinkler system for hours every day) all for $10 a night with our senior off season pass. And our hot spot worked so we had internet! 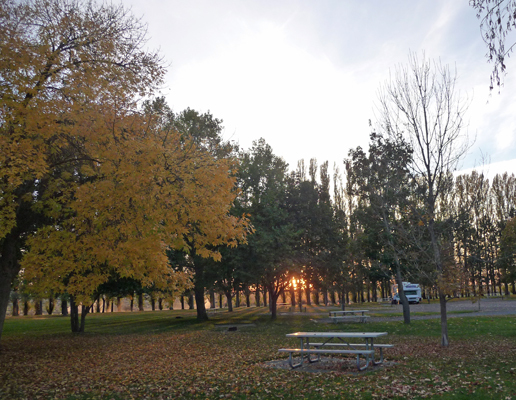 That evening, the setting sun peaked through the trunks of the Lombardy Poplars on the edge of the campground and lit up the fall color while it was at it. We had a number of neighbors that night but they all packed up and left the next morning, leaving us with just one or two rigs in our camp circle. Potholes is on the Potholes Reservoir which provides irrigation water to the lower Columbia Basin (lots of apples, grapes and hay in this area). The reservoir is formed by the O’Sullivan Dam. You drive over the top of the dam to go from Potholes to the wildlife refuge. The reservoir has raised the water table here and that has allowed many small lakes to fill depressions south of the dam. Soda Lake is formed by a dam and the fishing is supposed to be decent here. Once upon a time there was a campground here too but there was no evidence of it when we visited. There are lots of picnic shelters though and a boat ramp. Access within the refuge was limited because they close much of it from October 1 until March 31st to protect migrating birds (lots of ducks and geese come through here on the Pacific Flyway through the winter and then Sandhill cranes visit in February in the valley below). The numbers of Sandhill cranes have been increasing every year so that at this point the town of Othello, just to the south, has a crane festival in February now. We’d planned on driving a number of spur roads in the refuge but discovered that they were closed. But you could still get a great view of the Drumheller Channels from the main road. 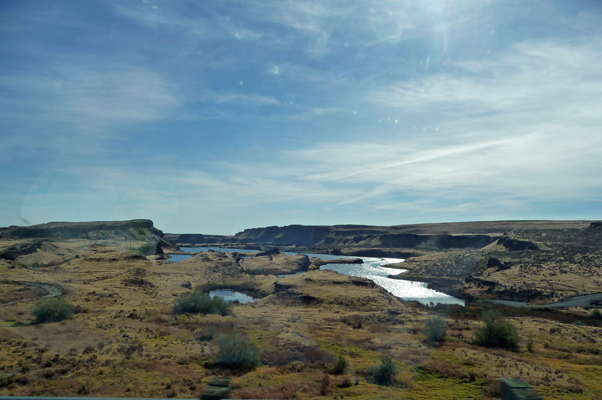 These channels were formed during the cataclysmic floods that created the scablands, most of the coulees and Dry Falls. These channels are now a National Natural Monument, setting aside not only the fantastic geology but the sage ecosystem that is the home to a number of threatened species of birds. We wandered around for a while until we found an overlook for Royal Lake. In the middle of winter you can find 10,000 ducks here but we didn’t see a one. We both found it interesting that these lakes don’t seem to create a greenbelt around that that most lakes do. They aren’t lined with poplars or willows and the grass isn’t even green near them. They’re just basalt basins full of water. We drove on back to Potholes and stopped at the boat launch to get a view of the reservoir to the north. And to the south. You can fish in this lake all year long and boy were there lots of fishermen, especially on Friday when we went out for our walk. It’s clearly much more a sportsman’s lake than one known for its beauty. 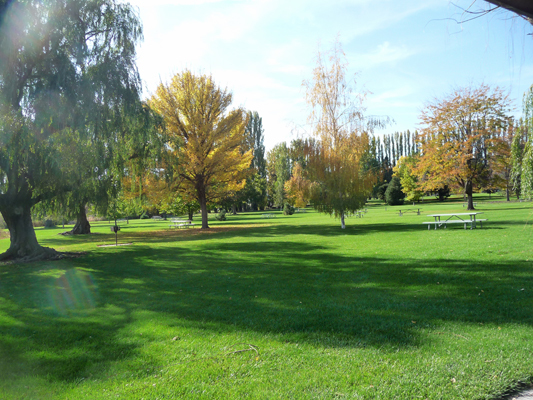 On Friday October 16th we took a walk through the park. There were tons of fishermen out and the one we talked to said the fishing was pretty good. 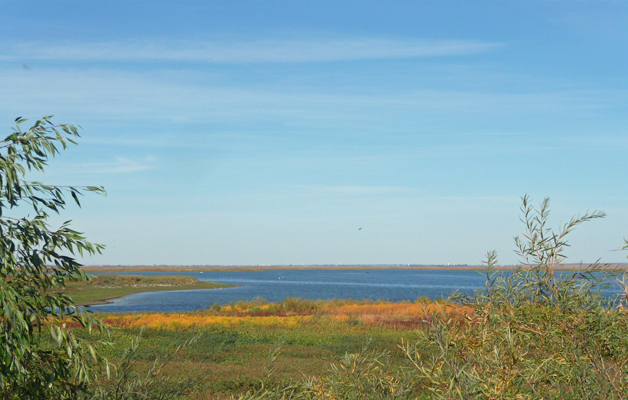 The trees in the Day Use Area had a lot of fall color which made a nice lake view. Looking back towards the campground where the row of poplars is, you can see how huge the Day Use Area is (and how many picnic tables they have). 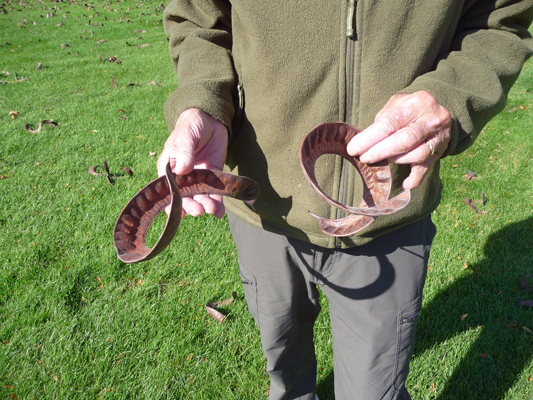 There was a honey locust tree that had really put itself out producing seed pods this year. The entire ground was covered with them. Their pods are huge and some were literally standing up in the grass. 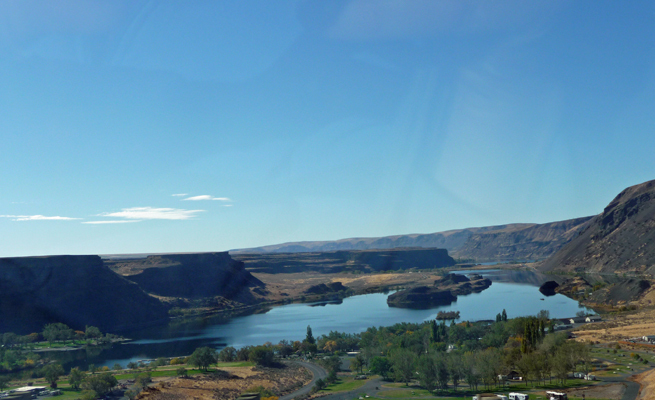 We spent Saturday October 17th at Potholes for one more day in the sunshine--doing laundry and grocery shopping--before heading back over the mountains to the Seattle area. We spent 2 nights at Dash Point State Park (2 more nights at $10 a night!) before we headed up to Monroe for a week of doctor’s and dentist’s appointments.